PasswordG is a free secure password generator that lets you create strong passwords in strength so that no one can ever guess or crack it. Of course, its important to keep highly secured and unique passwords as you need to provide security to all your confidential info and other important documents. This strong password creator also provides services to check the strength of a password. 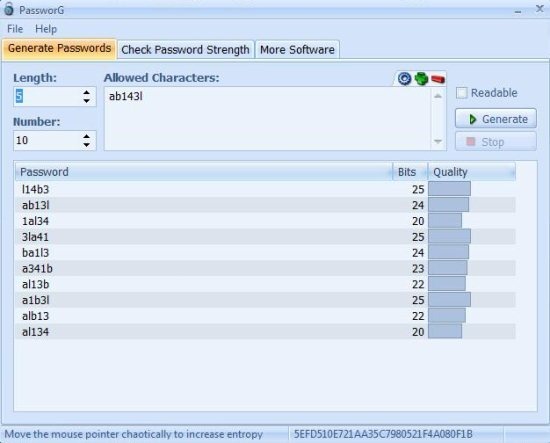 In other words, it comes up with in-built password checker to check the strength of a password. The good part is that if the software finds the created password weak then, it brings you a list of suggestions on how to improve the quality of a password. You can select one to use as your password for all confidential documents and content. Installing PasswordG in Windows 8 is as simple as it is to install it in other Operating System including Windows 7, Windows Vista, Windows XP, and the like. However, before I bounce out-of-the-way to its installation process, let me quickly jot down the features of this secure password generator below. Create n number of different passwords. You can save passwords in your system. Also, check out our post on Wise Folder Hider. Double-Click on the downloaded Zip file. You need to extract all files in order to Unzip. Yupp…now you are now ready to use this free password generator in you Windows 8 PC. In short, PasswordG is a nice utility password creator to create unique passwords so that you do not lose your confidential data, no matter who works on your personal system. Go ahead and download PassowordG in Windows 8 now…!